So, I ran that marathon I trained all summer for!! A month ago. I can’t believe I’ve been so busy with my new job that I haven’t had a chance to sit down and write a post about such an epic event. Oh yes, it was EPIC. The weather was more than perfect. The course was flat as a pancake. My training was spot-on and my cheer section rocked. I finished in 3:48, well under my “I’d like to go under four hours” goal. I ran 8:30-ish miles until about 21, slowed to 8:40 (my intended race pace) for two, then slowed a little more to about 9:20 for the last three. Andrew and I drove down to Erie on Saturday in time to grab my packet before joining another East Aurora Runner friend, Ellen, and her friends at their AirBnb for a homemade spaghetti dinner. We brought salad and Oreos, they supplied the noodles, sauce and meatballs. Sadly, there was no wine to be had–not before race day! We all woke up bright and early and headed to the start in the dark. Despite leaving with plenty of time to spare, we encountered major traffic near the entrance to the state park, so we ducked down a side road to park where Ellen and gang were staying and–thankfully–caught them before they ended up stuck in a sea of brake lights. We all piled out and started hoofing it toward the shuttle pick-up, not more than a few blocks away. After a trip to the porta-potties and some photos ops, we were all ready to go! Can’t you just FEEL the excitement on my face in the photo below?! I was truly excited to begin. I had expected more nervous butterflies–perhaps even the ‘why did I do this?’ anxious feeling in the pit of my stomach–but it never came. 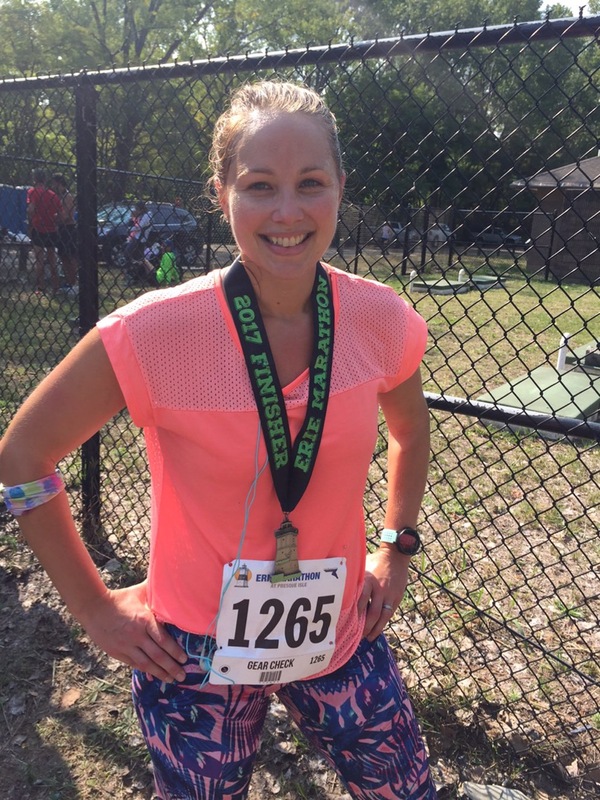 I knew I’d trained well, I was blessed with incredible weather and no bathroom issues–this girl was good to go! A huge shout-out to my friend, Stacy, who loaded up my iPod shuffle with perhaps the best running mix ever created. I had just under 3.5 hours of songs, all of which were new to me except four. FOUR. And I loved them all! I don’t even know what genre they are…alternative? I knew Stacy had good taste in music (she’s constantly going to see some lesser known yet hugely popular group in fun places like Toronto or ArtPark with her son) and as a runner also would know what I’d need for the big 2-6-point-2. She could not have designed a better playlist, and I may never update my iPod again lest I lose all those songs. Even as someone who rarely listens to music while running, I cannot even IMAGINE not having music during that run. The course may be scenic, but it’s also very quiet with almost no spectators except in a couple spots. Music is a must. Here I am at approx mile 10 (I think). Andrew stuck with Ellen’s sister to watch the race and were able to see me a few times. 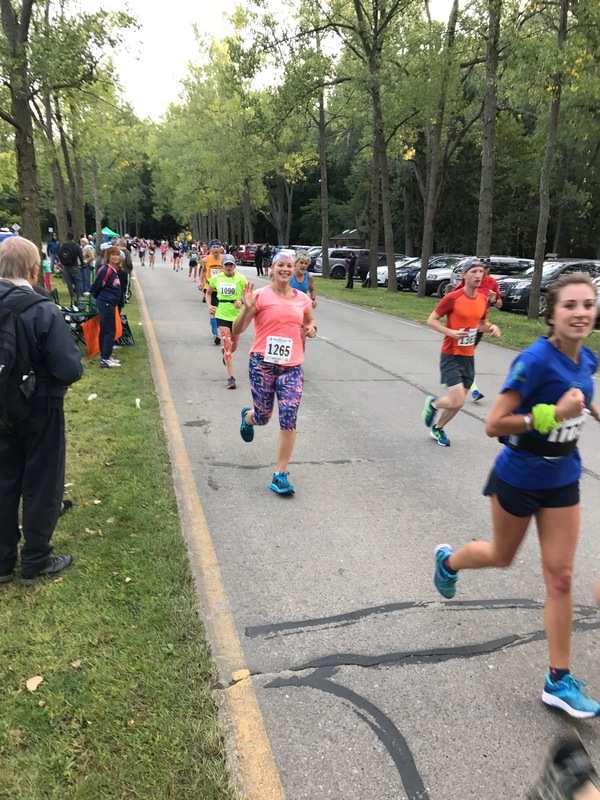 Presque Isle is a big oval-shaped state park, jetting out into Lake Erie, and one loop around is 13.1 miles, so it’s easy for spectators to walk from side-to-side and see their runners 3-4 times during the race. I don’t remember exactly which miles I saw Andrew, but I think it was 10, approx 18 and then at about 25.5…only 3/4 of a mile to go! By that time, my girlfriend Karisa had arrived and joined the cheering squad. I was so excited to see her and pass them, knowing I was so close to the finish! Look at how happy I am! My goal for this race–even more than a specific time–was to have a GOOD race. 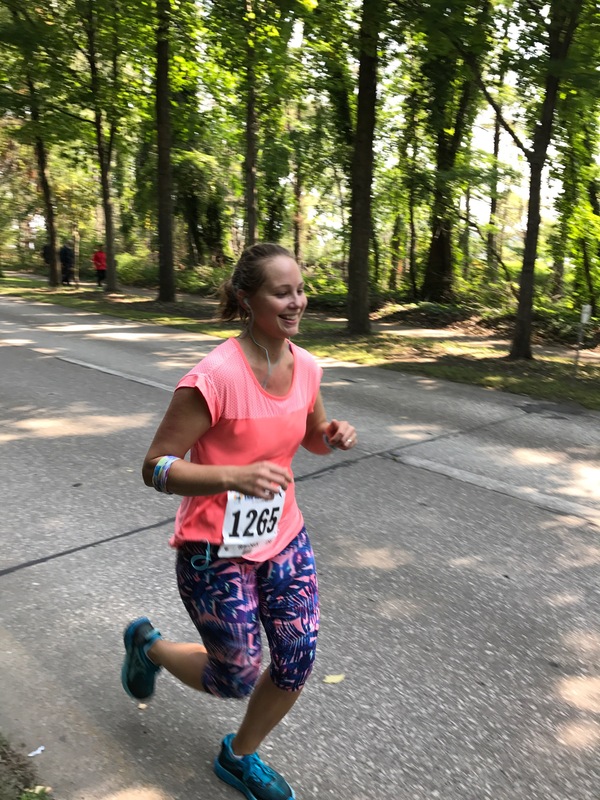 A strong race in which I maintained my goal pace, remained positive (even when it got hard) and finished strong at the end–no giving up, no walking, no tears. I remember saying to Andrew as I passed by at mile 25: “I’m tired but I’m OK!” In fact, I think we have it on video. I still can’t believe–a month later–the race went as well as it did. I’m almost afraid to do another one, since all three of my marathons (Chicago 2004, Marine Corps 2007 and now Erie 2017) featured perfect weather and were devoid of bathroom emergencies, injuries, etc. The first two were slow, but at least it wasn’t raining! I’m calling this my ‘redemption marathon,’ and boy, was it! I trained all summer and reaped the benefits of all that hard work–I was both mentally and physically tough. I was able to maintain about an 8:30 pace, about 10 seconds faster than the 8:40 pace Stacy, a veteran marathoner, had advised me to run. (She knew I could go faster, but both wanted me to push myself so as not to ‘waste this opportunity’–her words–but not so fast that I’d run out of gas. I tried desperately each mile to slow down, but my body settled in easily and I went with it. 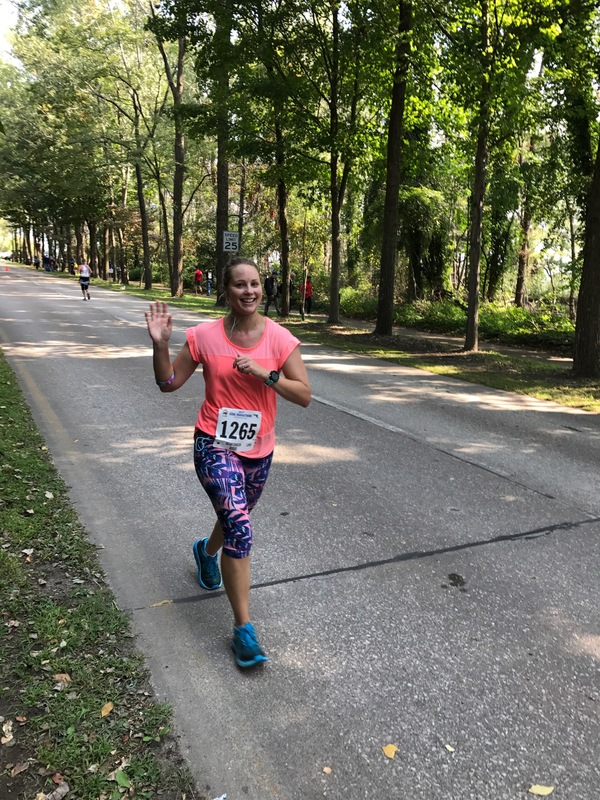 I had the 3:45 pace group in my sight the entire way and even though I wanted to join them, I knew in my heart I needed to run my own race and that I might sabotage my performance if I sped up to catch them. Plus, I was enjoying my music and taking in the sights around me; I didn’t need a group! While this race certainly isn’t the most ‘entertaining’ (big city races have that in the bag), it was flat, fast and down-to-Earth. I loved the laid-back vibe of it all, from the heartfelt (if not a little rambling) informational emails from the race director to the minimalist packet pick-up–two tiny tents of merchandise and a goodie bag filled with exactly three things: the race t-shirt, a tiny flashlight and a bib. Erie is cheap, known for good weather and an easy drive from Buffalo–it should be on every distance-runner’s bucket list! But I digress–back to the race. I pushed to the finish, waving at Ellen who had come in a whopping TWENTY minutes before I did (!!!) and crossing the line at 3:48. My ‘goal’ had been under 4 hours, and my time was even sweeter knowing that Andrew ran his first marathon–at age 22–in 3:55. Thirty-four year-old-Holly beat 22 year-old Andrew. I love it. I staggered toward the volunteers and readily accepted my medal. I wasn’t hungry AT ALL (in fact, after three energy gels and countless sips was water and sport drink, my tummy wasn’t feeling all that great), but I knew I needed something, so I grabbed the chocolate milk carton, Subway lunch box, banana and water bottle and headed into the crowd of finishers. It was then that I realized I didn’t know where anyone was, or where I should sit down. I leaned against a chain-link fence while the post-marathon brain fog settled in, preventing me from making a move for the grassy area in front of me. All I knew was that it was a little muddy where I was standing, and that I wasn’t about to sit in it. Thankfully, my friend Karisa magically appeared and helped me up a little hill where we could sit and visit. She’d driven almost 2 hours to come see me finish and I could not have been happier to see her. We chatted for awhile as I sipped my chocolate milk and waited for Andrew to appear–he’d decided to wait with Ellen’s sister to cheer for the remainder of our little party (Ellen’s sister’s boyfriend, a first-time marathoner; and her friend Sarah, another EA Runner). Finally, Andrew joined us and Karisa (who snagged a primo parking spot near the finish) drove us out of the park and back to Ellen’s Bnb, where I took a ‘bath’ between two parked cars using baby wipes and changed into fresh clothes. We hung out on the porch enjoying the weather until the rest of the group returned (having taken the shuttle) and we all decided pizza, beer and football-watching was in order. Andrew and I hung out for a few hours, enjoying guilt-free pizza-eating (at least for me) and reliving the race in conversation with all the other runners in the room. After the game, we headed back to East Aurora for a much-needed shower and another splurgy dinner, wings at the Nyes’ house. I have a feeling Boston will come calling, and when it does, I’ll be up for the challenge. 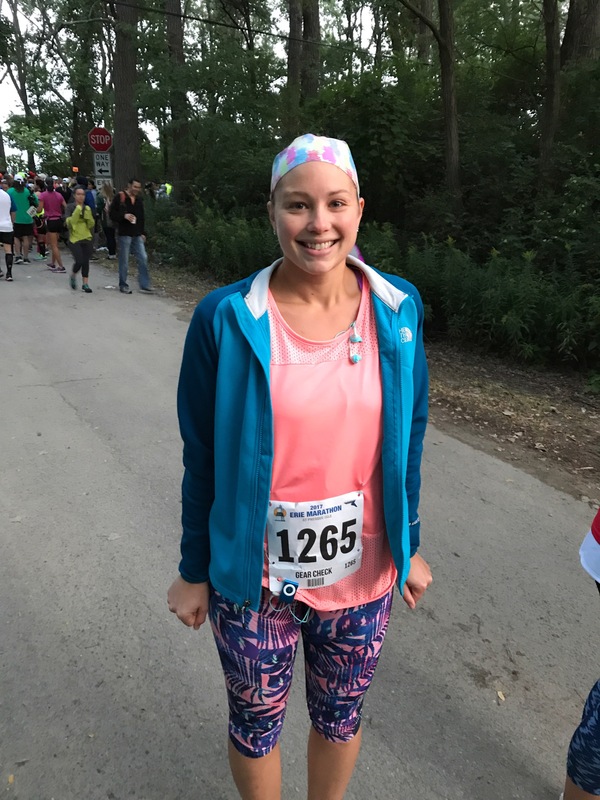 Posted on October 10, 2017 October 11, 2017 by thehealthypineapplePosted in i ♥ runningTagged 26.2 miles, East Aurora Runners, erie marathon, marathon, marathon training, presque isle, Running. Wow, so amazing, such a strong race!! Congrats! !